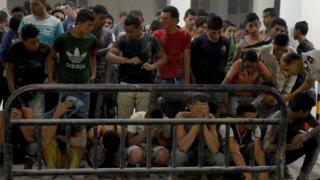 An Egyptian court has sentenced 56 people to prison over the capsizing of a migrant boat that killed more than 200 people in September. They were given sentences of up to 14 years, and the convictions included murder, manslaughter and negligence. The boat was bound for Italy when it sank eight miles (12km) off the Egyptian port city of Rosetta. Some 450 migrants were estimated to have been crowded aboard, including around 100 trapped in its hold. There were 163 survivors, mostly Egyptian. Syrian, Sudanese, Eritrean and Somali migrants had also been on board. Survivors said the boat had been kept off the coast for five days before departure, so that more migrants could be brought aboard. The boat capsized after a final group of some 150 people were brought onto the vessel, they said. A total of 57 people were charged, but one woman was acquitted. The lesser charges included not using sufficient rescue equipment, endangering lives, receiving money from the victims, hiding suspects from authorities, and using a vessel without a licence. Of the 5,096 refugees and migrants reported dead or missing at sea last year, 90% travelled along the Mediterranean sea route to Italy, according to the UN’s refugee agency.